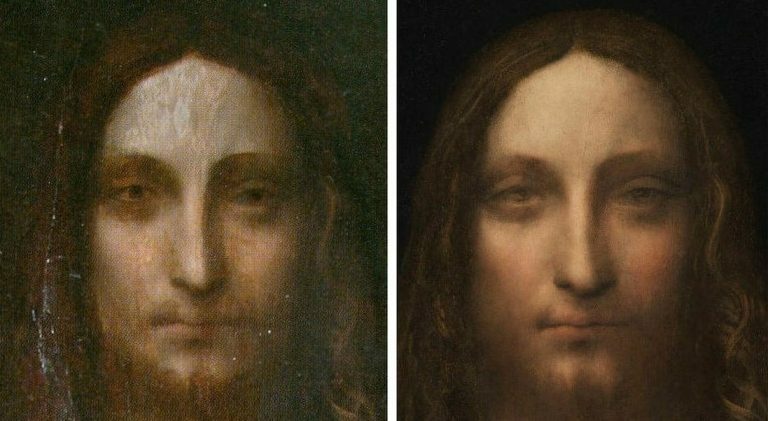 Dalya Alberge reports in the Guardian that a Leonardo scholar, Matthew Landrus, believes most of the upgraded Salvator Mundi was painted by a Leonardo assistant, Bernardino Luini. In her Guardian article, “Leonardo scholar challenges attribution of $450m painting”, Dalya Alberge further reports that the upgraded version of the Salvator Mundi that Matthew Landrus has de-attributed to Leonardo’s assistant, Bernardino Luini, is the very painting that was attributed to Luini in 1900, when acquired by Sir Charles Robinson for the Cook collection. Above, Fig. 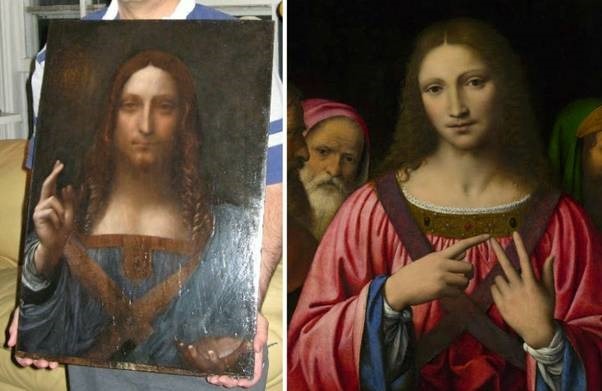 1: Left, the Salvator Mundi that was bought for $450m as a Leonardo for the Louvre Abu Dhabi in November 2017 as it was seen in 2007 when only part-repainted and about to be taken to the National Gallery, London, for a viewing by a small group of Leonardo scholars who are said to have been sworn to secrecy. (For the many subsequent changes to the painting see our “The $450m New York Leonardo Salvator Mundi Part II: It Restores, It Sells, therefore It Is” and Figs. 4 to 6 below.) Above, right: A detail of the National Gallery’s Luini Christ among the Doctors. Even after being sold twice (in 2013 and 2017) for a total of more than half a billion dollars, the painting’s 118 year long journey from a Luini to a Leonardo and now back to Luini again, remains a mystery: no one has disclosed when, from whom and where the painting is said to have been bought in 2005. Professor Martin Kemp recently disclosed that the work was bought for the original consortium of owners “by proxy”. Long-promised technical reports and accounts of the provenance have yet to appear and keep receding into the future. These lacunae notwithstanding, the painting is scheduled to be launched at the Louvre Abu Dhabi in September, and also to be included in a major Leonardo exhibition at the Paris Louvre in 2019. As Dalya Alberge reports, a number of Leonardo scholars have contested the present Leonardo attribution and held the work to be largely a studio production that was only part-painted by Leonardo himself. Frank Zöllner, a German art historian at the University of Leipzig and author of the catalogue raisonné Leonardo da Vinci – the Complete Paintings and Drawings, believes it to be either the work of a later Leonardo follower or a “high-quality product of Leonardo’s workshop”. Carmen Bambach, of the Metropolitan Museum of Art, holds it to have been largely the work of Leonardo’s assistant Giovanni Antonio Boltraffio. One scholar, Jacques Franck, suggested in a 29 November 2011 interview in the Journal des Arts that an attribution to either Luini or Leonardo’s late assistant (and effective ‘office manager’) Gian Giacomo Caprotti, called Salai or Salaino seemed plausible and persuasive. More recently, in January 2018, he tipped to Salai as the author because of strong similarities revealed by penetrating technical imaging examinations – see Figs. 2 and 3 below and “Salvator Mundi LES DESSOUS DE LA VENTE DU SIECLE”. Above, Fig. 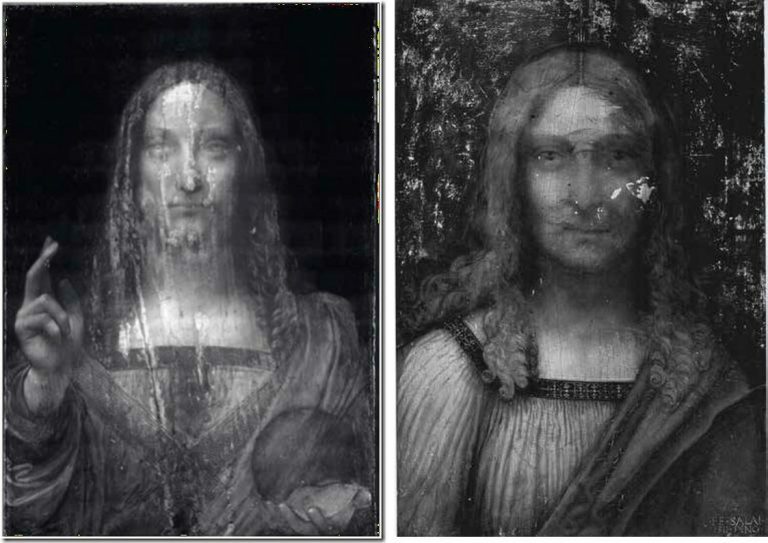 2: Left, an infra-red reflectogram of the Louvre Abu Dhabi Salvator Mundi; above, right, an infra-red reflectogram of Salai’s Head of Christ, signed and dated 1511, Pinacoteca Ambrosiana (Milan). ABOVE, FIG.4: From the left, Face 1 – The former Cook collection Salvator Mundi when presented in 2005 (– when still “sticky” from a recent restoration) to the New York restorer, Dianne Dwyer Modestini. Face 2: The former Cook collection painting after the panel had been repaired and the painting had been stripped down. Face 3: The former Cook collection Salvator Mundi after several stages of repainting and as exhibited as a Leonardo at the National Gallery’s 2011-2012 Leonardo da Vinci, Painter at the Court of Milan exhibition. Face 4: The face after yet further (- and initially undisclosed) repainting by Dianne Dwyer Modestini at Christie’s, New York, ahead of the 2017 sale – as was first published by Dalya Alberge in her Mail Online revelation: “Auctioneers Christie’s admit Leonardo Da Vinci painting which became world’s most expensive artwork when it sold for £340m has been retouched in last five years”. Above, Fig. 5: Left, the former Cook collection painting’s face as in 2005; right, the face, as transformed over twelve years by Modestini, when presented for sale at Christie’s, New York, in November 2017. Alberge’s current Guardian article, “Leonardo scholar challenges attribution of $450m painting” has gone viral – see for example: CNN’s “Leonardo’s $450M painting may not be all Leonardo’s, says scholar”, and the ABC (Spain) “Crecen las dudas sobre la autoría del «Salvator Mundi» de Leonardo”. We make the following observations. Although Professor Martin Kemp is not a curator at the National Gallery he does seem to have been considered at one point as a possible co-curator of the National Gallery’s 2011-2012 Leonardo exhibition, which, in the event, was curated solely by the Gallery’s own then curator, Luke Syson, who is now at the Metropolitan Museum of Art. Syson drew heavily for his 2011 catalogue entry on the painting on the researches of one of the owners of the Salvator Mundi, the New York art dealer, Robert Simon: “This discussion anticipates the more detailed publication of this picture by Robert Simon and others. I am grateful to Robert Simon for making available his research and that of Dianne Dwyer Modestini, Nica Gutman Rieppi and (for the picture’s provenance) Margaret Dalivalle, all to be presented in a forthcoming book.” That book has now been coming for some time. First promised by the National Gallery in 2011, it was more recently promised for 2017, and then for this year, and now, for next year – and possibly in time for inclusion in the catalogue of the Paris Louvre’s planned major 2019 Leonardo exhibition? Professor Kemp also promised a conclusive body of evidence for his attribution to Leonardo of the drawing he dubbed “La Bella Principessa”. In his 2012 book Leonardo’s Lost Princess, Peter Silverman, the owner of “La Bella Principessa”, wrote: “Martin believed that the fingerprints [compiled by the now discredited fingerprints expert Peter Paul Biro], though not conclusive on their own, added an important piece to the puzzle. He wrote to me, ‘This is yet one more component in what is as consistent a body of evidence as I have ever seen. I will be happy to emphasize that we have something as close to an open and shut case as is ever likely with an attribution of a previously unknown work to a major master. As you know, I was hugely skeptical at first, as one needs to be in the Leonardo jungle, but now I have not the slightest flicker of doubt that we are a dealing with a work of great beauty and originality that contributes something special to Leonardo’s oeuvre. It deserves to be in the public domain.’” In the event, the “La Bella Principessa” drawing did not enter the public domain. Unlike the Salvator Mundi, which sold for $450m, it was not included in the National Gallery’s 2011-2012 Leonardo exhibition and it presently remains, so far as we know, unsold, in a Swiss free port. Above, Fig. 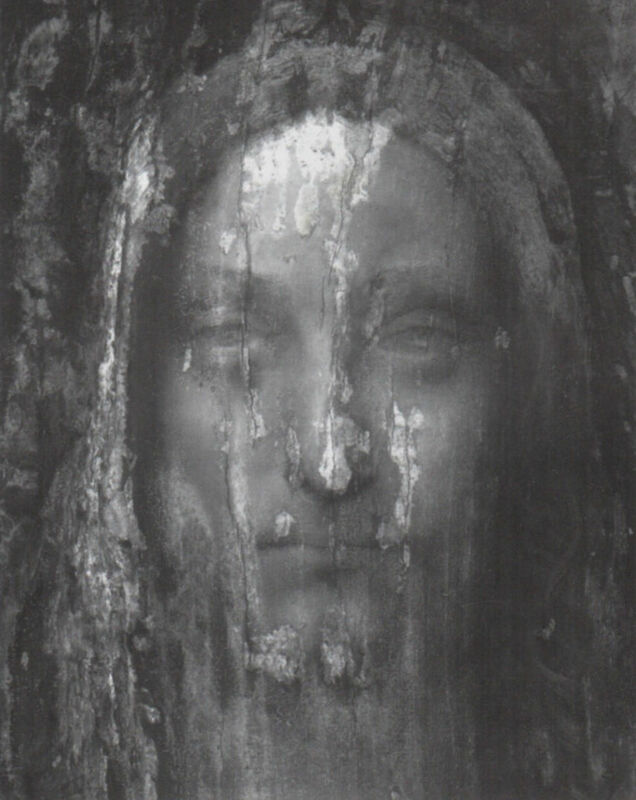 6: Left, the small-scale published (infra-red) technical image of the Salvator Mundi; centre, the painting as exhibited in 2011-2012 as a Leonardo at the National Gallery; right, the painting as presented for sale at Christie’s, New York, in 2017. Much remains to be examined with this restoration-transformed but still, effectively, unpublished work where the promised reports on technical examinations and provenance seem perpetually trapped in the post like Billy Bunter’s postal order. Note in Fig. 6 above, for example, the radical changes made to the true left shoulder draperies; to the orb and the sole of the hand that holds it; and, above all, to the face. We must hope that the painting’s new owners will encourage the old 2005 consortium of owners to publish their privately commissioned researches as soon as possible. In general terms, it would be a much better thing if new and elevating attributions were once more published by single scholars, taking full responsibility in a scholarly publication, so that the case for a work’s re-attribution might be examined widely and discussed openly on a fully informative account and presentation of technical evidence and history of provenance. The recent tendency for owners to hold and selectively part-release researches during promotional campaigns of advocacy is not conducive to best scholarly practice.